Saturday. We woke up early in the morning. Primarily because Mili had the same fate as I did the night before and was unable to get a good night's sleep. As a result she was all set to start even before it was dawn. The kids were tired and slept deeply. Yet, we decided to wake them up and get going so that we could reach our next destination before it was dark. I almost always avoid driving after dark when we are travelling away from home. Just in case something went wrong - could be with the vehicle or health related - the last thing I would want is to get stranded on a lonely stretch of the expressway. No matter how safe things looked danger can lurke from practically everywhere. There had been several case of highway murders. Don't want to sound like safety freak but it is better to be safe than to be sorry. Like all other Super 8 motels this motel had continental breakfast as well. Nothing too grandiose. In the narrow lobby in one corner they had set up couple of small tables with several usual items like cereals, milk, muffins, eggos, coffee etc. There was a Caucatian woman attending the counter. She was a middle aged woman with a cranky attitude. Not sure exactly what she had done or didn't do but Mili was quite offended. She later mentioned to me that the lady was giving her an attitude. I personally did not feel she was mean or anything but at the same time I also knew that often Caucatians can be snubby regardless of their social stature. Mili is usually the friendliest person on earth. I kind of felt bad for her as she really looked disturbed by this. All she did was trying to get the kids a good breakfast. The woman did not have to give her the look. When we pulled out from the motel parking lot it was little after 7 am in the morning. As I drove the van into the isolated Saturday morning expressway the kids tried to relax in their seats and get some sleep. Mili was still slightly sour from the early morning experience. I usually like to constantly chat with her when I am driving which keeps me focused. I tried to drive quietly until she warmed up to make any kind of conversation. Our destination was Atlanta, Georgia. 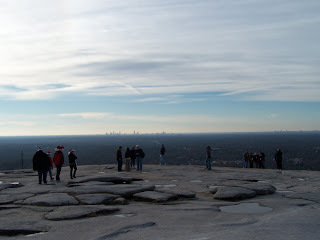 One of my close friend from Dhaka university lived in the suburbs of Atlanta. Total distance to his place from Lexington motel as per google map was about 620 kilometers. Roughly it should take us about 6 hours of driving time and an hour for lunch or washroom break. We could be in his condo apartment before 3 PM, beating the darkness by at least an hour. Solid planning. One must admit. It was a quiet winter morning with clear roads. It had snowed here lately and the fields were covered with thick sheet of snow. As we moved at a speed of 120 kilometers per hour the white fields looked very pleasing to the eyes. Soon Mili had regained her composure and we cheerfully chatted on. 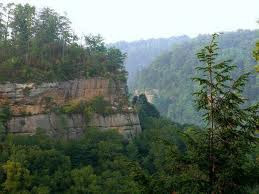 On our way we traveled through Danielle Boone National forest. This part of the landscape was very hilly with dramatic turns. It had snowed here as well and most hills were covered with white snow. In some areas we also encountered dense fog. Over all it was quite interesting. Once we entered Tennessee things gotten a little flatter. We stopped at Lake City and the kids played a little in the McDonalds’ indoor games facility. We drove through Knoxville, Chattanooga and entered Georgia. 1.In Knoxville on May 1, 1890 the first electric street car ran from Gay Street to Lake Ottossee (now Chilhowee Park). 2.Downtown Knoxville is 936 feet above sea level. 3.The soft drink Mountain Dew had its beginnings with Hartman Beverages in Knoxville in the late 1940's. 4.Knoxville Zoo is the Red Panda Capital of the World, having the greatest success in breeding and survival of baby Red Pandas. We pushed hard and reached Atlanta in Kaz’s place around 2:30 PM. Atlanta looked very green from the outskirt. The apartment complex where Kaz lived was very nice with hills at the back drop and tall pines and Oak trees surrounding the compound. We were to stay here two nights. Our goal was to visit the Atlanta Aquarium touted as the largest in the world and the Stone mountain – a very popular and unique rock formation. Kaz’s wife and kid was away visiting Bangladesh. However he was a good cook and was determined to ensure that we did not feel the absence of the lady of the house. He cooked, baked and mashed all kind of things and offered us nothing less of a royal luncheon. The kids were very relaxed and happy realizing they won’t have to be on the road for almost two days. 6. One of only two cities in the world to be home to two Nobel Peace Prize winners. At the age of 35, Martin Luther King Jr. was the youngest man to receive the Noble Peace Prize in 1964. President Jimmy Carter received the Nobel Peace Prize in 2002. Goofs: While in Kaz's home, Mili went to the parking lot to bring back some stuff from the car. Hours later when we went down to go to the mall I found out the driver side sliding door wide open. Fortunately nothing (including the whole car) was stolen. I thanked God for one more time. This trip was really turning out to be rewarding. The largest mall in the Southeast America - Lenox Square is located in Atlanta. We spent the evening roaming around the mall. I hate malls no matter how big or how grandiose. As far as I am concerned they are the most boring place on earth. Mili had a great time though. She bought little but checked out a lot - just like most specimen of her gender. We visited the Georgia Aquarium the next morning. 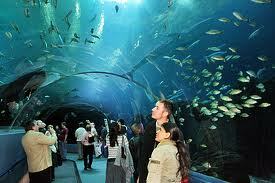 It is advertised as the world's largest aquarium. Since it had opened several years ago I had made a note to visit it. 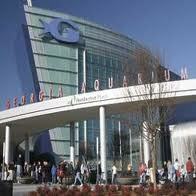 Being an aquarium enthusiast it was a must see for me. The Georgia aquarium was a true blast. 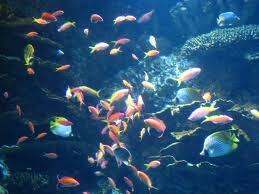 We have been in other aquariums but this was a really wonderful experience in every sense. The kids loved it (and they usually hate everything). 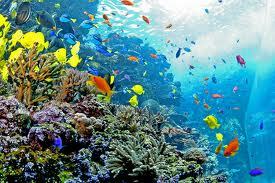 I thought the coral reef with the extremely colorful fishes was out of the world. Anybody who is visiting that particular part of the world should make some time to visit this place. Stony Mountain Park was the other local attraction that we visited later in the afternoon. 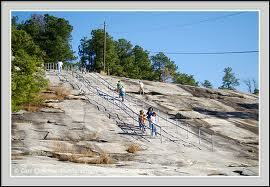 This is a popular destination for the local people as the park has many different type of activities for all ages. 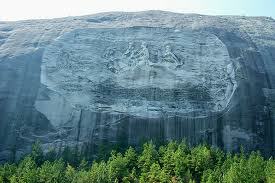 It also has the world's largest bas-relief (is a sort of sculpture where the sculpture has less depth behind the faces or figures than the actual faces or figures would have, when measured). 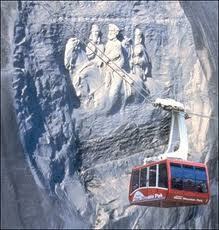 There is a cable car to carry people between ground and the top of the mountain. 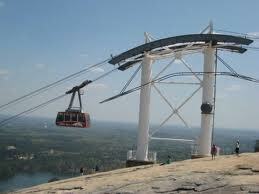 Kaz took Mili and the kids in the cable car while I opted out for the walking trail that went up the mountain. It is about 900 feet tall and the walk to the top is a very nice and scenic one, not extremely difficult but at the same time provided me with enough work out. The view was definitely worth the extra work. paid option? There are so many options out there that I'm totally confused .. Any tips? Appreciate it! your blog and in depth information you offer. It's good to come across a blog every once in a while that isn't the same unwanted rehashed information.